from blurring into the next. we can hum along with. in one long, silken strip. © by Judith Waller Carroll. 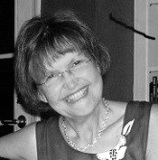 Judith Waller Carroll is the author of The Consolation of Roses, winner of the 2015 Astounding Beauty Ruffian Press Poetry Prize, and Walking in Early September (Finishing Line Press, 2012). Her work has appeared in numerous journals and anthologies and has been nominated for Best of the Net. Judith was born and raised in Montana, lived for many years in the San Francisco Bay Area, and now lives in the Ouachita Mountains of Arkansas with her husband, novelist Jerry Jay Carroll. Love the language and images in this poem. What a wonderful poem. Thank you. I love the way you peeled the peach. Beautifully written and crafted! Well done, Judith.